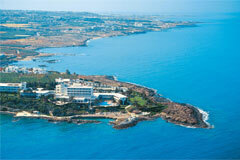 The Cynthiana Beach Hotel is set in one of the most unique and beautiful locations of Paphos, Cyprus offering a choice of both rocky and sandy beaches. It is within easy reach of bustling Kato Paphos with its picturesque fishing harbor, the medieval fort and some of the most fascinating ruins and archeological sites on the island of Cyprus. The hotel is located just 20 minutes from Paphos International Airport and 1 hour and 30 minutes from Larnaca International Airport. High standards of guest comfort are found in 230 beautifully appointed rooms and luxury suites, all fully air-conditioned with private balcony or terrace and feature bathroom, direct dial telephone, radio, hair-dryer, satellite TV, safe deposit boxes and maid service. 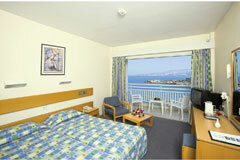 •	The Artemis Restaurant: Offers an exquisite full buffet breakfast or dinner, and theme nights. 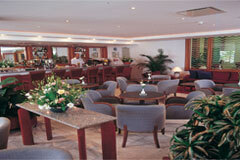 •	The Iris Restaurant: Serves a wide selection of buffet breakfast, refreshments and snacks. •	The Mythos Snack Bar: An elegant place to relax and enjoy a buffet lunch or an a la carte menu. •	The Argonaut Bar: Offers cocktails and traditional drinks. •	The Olympian Bar: Situated next to the pool serving long cool drinks. •	The Beach Bar: Serves a variety of drinks and delicious snacks right on the beach. The hotel complex offers an outdoor swimming pool, a large indoor swimming pool, tennis court, gym centre, diving centre, water sports and beach volley nearby.